These photos are of our week in Imatra. The town has two main industries, a large paper mill, and a large steel mill. We were able to visit both as you can see fromt he pictures below. 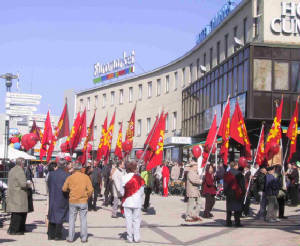 Imatra is located very close to the Russian border. We visited the Finnish side of the border crossing and got a first hand look at what is done to process people and vehicles through from Russia. The border patrol allowed us behind the passport desk and into their interigation rooms for a very interesting tour. We also got to get right up close to the Russian border and observe the Russian border patrol greeting vehicles entering Russia. 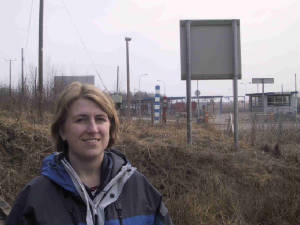 Here, Jacquie stands in front of the blue and white Finnish border marker, with the red and green Russian border marker about 10 meters beyond that. 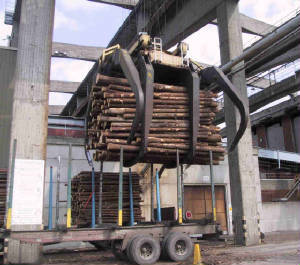 The equipment used to move timber around the paper mills is amazing. Entire railway cars and trucks can be loaded and unloaded in a couple of scoops of these huge cranes. This is only a small portion of the lumber depot we visited. It was said to hold enough lumber for only two weeks of operation of the paper mill in Imatra. 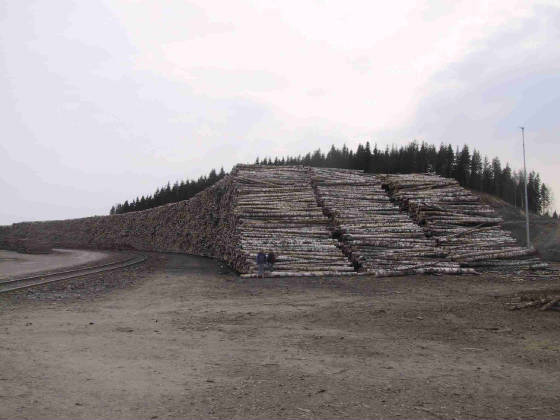 The timber is continuously being replaced to keep up with the usage of the mill. If you look closely you can see Erica and Christine standing at the base of the lumber pile. The canyon below is part of what was once a natural rapids area in Imatra. Following the daming of the canyon for a hydroelectric plant, the rapids are now opened up daily in the summer to promote tourism. 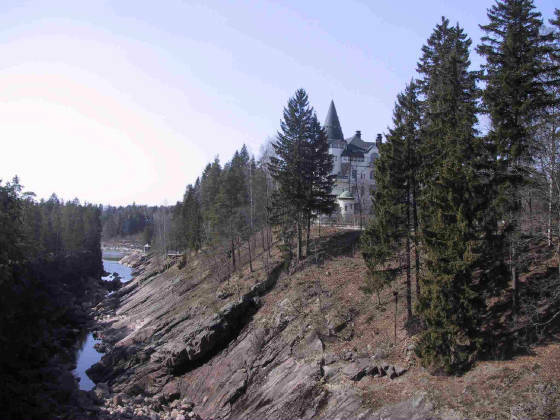 The large building on top of the rapids is a historic hotel that also is a very popular tourist sight. 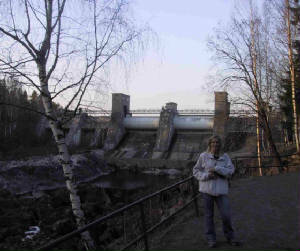 We did not get a chance to see the rapids open while we were there in Imatra, but we all would like to come back sometime to see the water, lights, and hear the music playing during the 20 minute opening of the dam each summer evening. May 1st, is a national holiday in Finland. Vapuu is the day for workers and students to celebrate the coming of spring. We observed a parade, music, and entertainment in the downtown area. 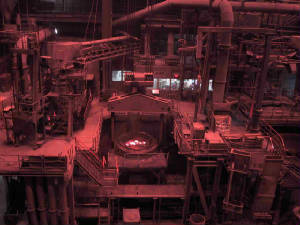 In the Ovako Steel Plant, we observed the making of steel products from scrap metal. The scrap is melted in large caldrons and then poured into square molds. Here the meldted steel can be see in the caldron, waiting to be dropped into the molds. 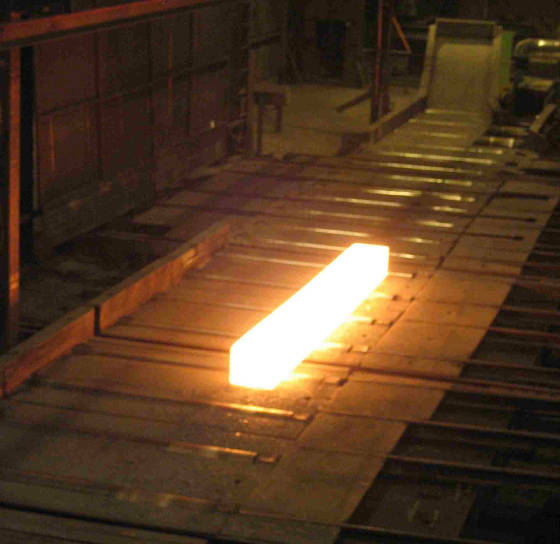 Melted scrap steel is poured down into sqaure forms to create white hot bars of steel that is then converted into steel products of various shapes and sizes. The mill is very dusty and noisy, and you can feel the hot air as the white hot bars pass through the plant. 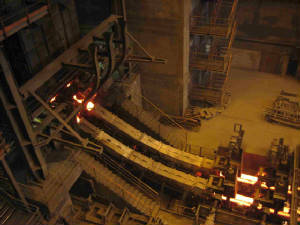 Below, a hot steel bar is rolled across the mill floor to the sized and shaped by waiting machines. 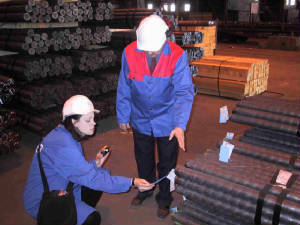 Tracy does a final inspection of steel rods produced in the mill. 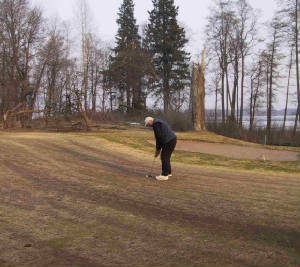 Bob did get to squeeze in 18 holes with his host at the Imatra Golf Club. The land just across the lake behind him is in Russia. Rotary District 7370 GSE Team - Contact Bob Lombard - Team Leader with comments.